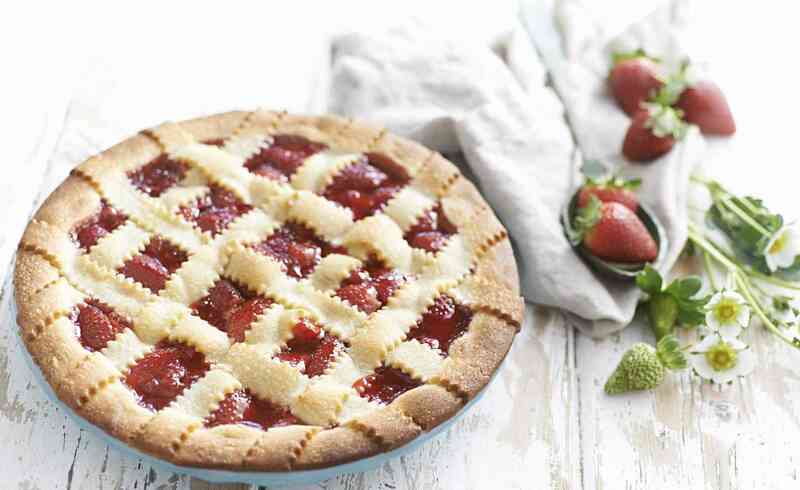 A classic sweet pie that is prefect in any season. Preheat oven to 180°C and line the pie dish with 2 sheets of pastry, making sure the pastry is pushed down into the corners. You will have to cut and join the pastry to fill in the gaps. Trim of excess pastry with a knife and use the remaining pastry to line the top of the rim, then with thumb and index finger pinch around the edge to form a crimped effect. Blind bake – line the base with baking paper and fill with rice, lentils or pastry weights. Bake for 15 minutes then remove the paper and weights. Brush the base of the pie shell with egg wash and bake for a further 10 minutes to crisp the pastry. In a small saucepan mash 1 punnet of the strawberries and add caster sugar. Stir over a medium heat until strawberry pulp begins to bubble and sugar dissolves. Add the lemon zest, vanilla seed paste and the cornflour blended with the water. Stir continually until the liquid begins to bubble rapidly. Let boil for 1 minute until it forms a very thick custard consistency. Set aside to cool. Cut the remaining 3 punnets of strawberries in half lengthways and place in a large bowl. When the sauce has cooled, gently fold through the fresh strawberries. Pile the Victorian strawberry filling into the pie shell. Slice the remaining pastry sheet into 1.5cm strips. Brush the outside rim of the pie shell with egg wash and create the lattice top by weaving the strips of pastry and pressing the ends into the pie edge. Brush the pastry with the remaining egg wash and bake for 15-20 minutes until the lattice top is cooked through. Let cool for 30 minutes before serving dusted in icing sugar and with scoops of vanilla ice cream.